You can reschedule an appointment by either editing or dragging it. On the Schedule menu, click (or tap) Calendar. On the Calendar page, click (or tap) and hold an appointment, and then click (or tap) an open time slot on a different date (if you are viewing the schedule by week) and/or time. Operatory - If you are viewing the schedule by operatory, and you drop the appointment in a different operatory than the one the appointment was originally scheduled in. 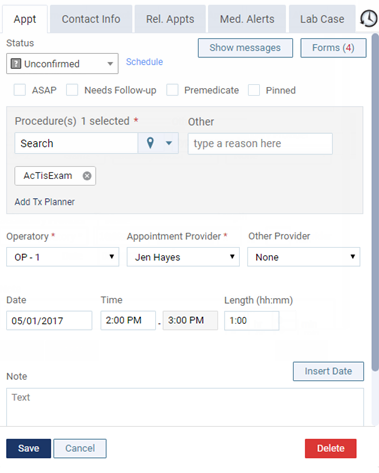 Provider (One) - If you are viewing the schedule by provider, and you drop the appointment in the column of a different provider than the one the appointment was originally scheduled with. On the Calendar page, click (or tap) an appointment. The Appointment Information panel opens. Optionally, click (or tap) the Schedule link. Navigate to a different date on the schedule if necessary. Change the view as needed to display the schedule by provider or operatory, and by day or week. Click (or tap) an open time slot. Does ascend have a appointment quick-fill?